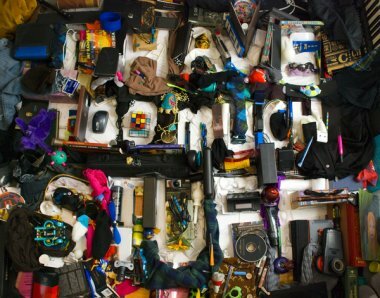 It is a well known fact that all of us have… too much stuff. In fact, we own so much stuff, there are multi-billion dollar industries created to organize and store all our stuff. We have so much stuff it won’t fit into our 3,000 sq ft houses and we have to store it off-site in storage garages. So much stuff that we have organizational plastic bin ‘systems’ that helps manage it. So much stuff that my friends with children constantly complain about tripping over toys and the cost of raising kids because of all the stuff that ‘comes with them’. And it is not only material things that crowd our lives but also mental things that crowd our minds. This post explains how we have come to live with less and have more. The solution is so simple, it’s mind-blowing: Get rid of most of it. We can say that now because we’ve gotten rid of most of our stuff, but we were in the same boat a few years ago. Although we lived fairly minimally in the US, we still had more than we needed, a LOT more. Living abroad has redefined our dreams and educated us even more to just how much we really need to be comfortable, happy and enjoy life. It’s really not that much. We consider ourselves spoiled, completely spoiled. 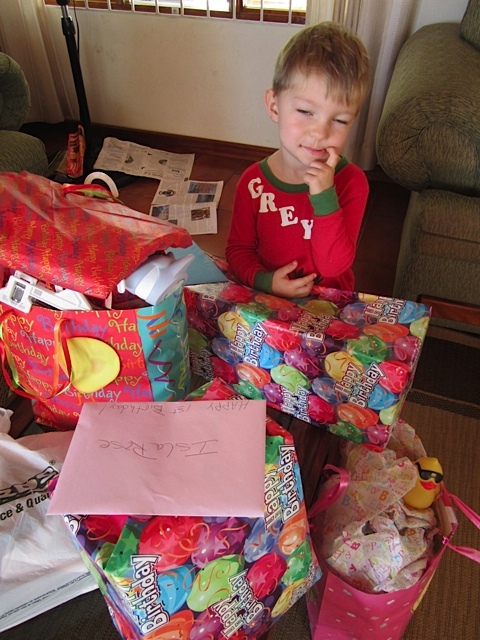 But you’d be surprised to know that all of our ‘stuff’ (including the kids toys) can fit into a few suitcases. For a family of four, that’s pretty awesome. We’ve learned to live with so much less. At first, getting rid of most of our stuff was very frustrating, scary, and sad. But over time it became easier – until we didn’t even notice that anything was missing – because, in reality, nothing was missing. We didn’t need all the stuff. The initial stages were frustrating. “Where is my (fill in the blank)? I can’t do xxxx without xxxx!” It doesn’t matter what you fill in the x’s with, because whatever you are trying to do, probably can be done without it. I was especially frustrated in the kitchen. “I can’t make a cake without my Pampered Chef stoneware pan” and ” I can’t make frosting without a mixer”. But I did and it was delicious. Seeing most of our stuff go was also a bit scary and sad. We felt like we were “losing” everything we had worked so hard for, but, in fact, we were about ready to gain more than we had dreamed. Many articles have been written about the subject. In short, having more than you need or are going to use costs money, time and emotions..more than you think. One of the most popular bloggers that writes about living with less is Leo Babauta. Leo writes about thriving and focusing on simple enjoyments. He offers beautifully simple advice that can transform your life and ease your stress. If you’re interested in de-stressing and de-cluttering your life, you can get a free download of this ebook here: Thriving on Less or visit his blog. We made do with essentials, and by doing so, that initial frustration turned into acceptance and then to an increased level of happiness. How? When you learn to live with less, there are less options and fewer decisions to make. Just this simple thing makes life easier. It really does. When you finally accept it, there is also less frustration. Isn’t that ironic? At first having less options was frustrating and now it is liberating. When you come to the realization that you don’t need most of the things that you keep, it is a milestone. You don’t know that ridding yourself of all this stuff is going to make you happier. In fact, most people are fearful of losing of their things. Material possessions are a security blanket for people, culturally, socioeconomically or emotionally. But they are a false security blanket. Once you get rid of stuff you feel freer, lighter and happier. We used to own 7 mixing bowls, now we have 2. We used to have different cocktail glasses for drinks: margarita glasses, wine glasses, on the rocks glasses, champagne glasses. It’s funny to us now, because one simple glass is all we need for any libation. You begin to experience that less stuff leads not only to more money, but also to more time, more security, more power and more focus on the things or experiences you really want out of life. Less really is more: more of the important stuff. I think one reason people are so stressed is because of the clutter they have, need to pay for, maintain and store. We don’t feel like we’ve sacrificed anything. We’ve gained so much time and freedom that any frustrations that may come up are minuscule in comparison to the feeling of lightness that we have. Items we don’t need for day to day living This can mean anything. For us, it means living with 6 place settings, not 16. We have a tiny family of 4 and don’t need the excess. What about that KitchenAid mixer sitting on your counter that you may use once per year? If you are only using something once or twice per year, get rid of it! You can always borrow one from someone else who has too much stuff. Borrow, don’t buy. Before you buy always ask yourself how often you are going to use or wear the item. Owning a Home We used to think that only poor people rented. Why wouldn’t they just buy their home? Well, in reality no one really buys their home unless you pay for it in cash. A mortgage is, in a sense, a rent payment that you make to the bank (especially if your house is not increasing in value more per year than your mortgage rate…hello recent recession!). With the big dive in housing prices, we essentially ‘rented’ our home in Colorado from the bank, meaning, the value of our home stayed the same as when we bought it 8 years ago. Now we rent furnished homes in places that some people only dream of vacationing, and it is much cheaper than you think. A lot cheaper than our mortgage. The size of your home Most people’s houses are way bigger than they really need. Usually to hold all the extra stuff they don’t need. Why do you need that extra guest bedroom and bathroom for that once a year when someone stays with you? Does each child NEED their own room? Do you really need a living room and a family room and a rec-room in the basement? Our family of four lives very comfortably in a 1000 sq. ft. 2 bedroom condo. Car We have learned that having just enough car for what we need is ok. In Costa Rica we had a small Diahatsu Terios which just fit our family of four (we could squeeze another person in the back seat when needed). We almost didn’t buy it because we thought we needed a bigger car for those very few times when we would need to take more people. Having a smaller car meant less gas, less insurance and less maintenance. Now, we don’t even need a car. We can walk to get what we need and take public transportation when we want to go farther. Take a look at your car situation. Do you really need one that big? Do you really need one that fancy? Do you really need two or three? Do you really need one at all? Kitchen Gadgets and accessories The only kitchen gadgets that we currently have is a blender, toaster and coffee maker (the last two are not ours, they came with the place we are renting). Any type of food processing can be done in a blender. Mixing can be done by hand and chopping can be done with a knife. Do you really need separate dishes for everyday and special occasions? How many pots and pans do you use at one time? Two good knives is all you need. Take a day and go through your kitchen and put all the extra stuff in a box that you do not use on a normal basis. If you do not go back to that box in a few weeks, get rid of it! Kids toys We have a few kids toys, but not many. Even before we had children, we didn’t want them to be distracted by bells and whistles that required no thinking. We wanted them to use their imagination…”Here’s a stick and a rock. Now go outside and make up something!” And that is what our children do. They use their minds, they look for fun opportunities to be creative. Most children have WAY too many toys. This is created by parents who feel they need to give them things they did not have or want an easy distraction for their children. This really hit K one day when he was in the foreclosure clean-out business and they filled two 30′ dumpsters with toys from a house. The kids had taken what was important and left the rest. Teach your children that less is better by setting the example. Baby stuff Once you have your first baby, you realize just how much of that “required” stuff you do not need. All a baby really needs is a mother’s milk, to be kept warm, and LOTS of love. 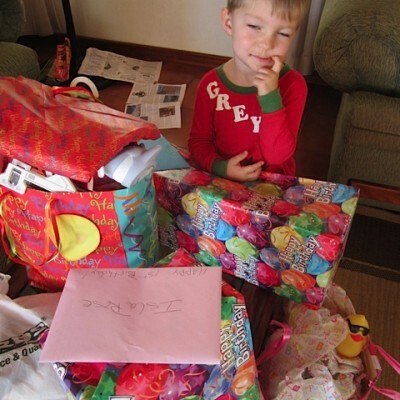 We realized this with our first baby G, but when our baby I was born in Costa Rica, we had very little “baby stuff”. Breast milk, a baby sling, clothes, diapers, and wipes is about all she needed to be happy and healthy. Food An entire other article can be written on this subject. But we have learned that keeping food simple is the most healthy and least expensive way to eat. Living in different countries and not having all the options of the US, has taught us to cook more simple and use fresh, local foods. Our food pantry, which is a small cabinet, consists of spices, sugar, rice, beans and pasta. We eat a lot of fruits, vegetables, beans, rice and occasionally some fresh fish or chicken. We limit the amount of processed food and going out to eat. This leads to a much more healthy lifestyle and keeps food simple. Drama This isn’t a material thing, but it is a key to creating happiness. Letting go of the people in our lives that incessantly create and feed off of meaningless drama have lightened our emotional lives. This can be difficult to do, because it can mean letting go of some friends and even family. Instead of focusing on drama, we focus on our little family, our wonderful friends and the fun we are having together. Insurance, doctors, and medication The only insurance we currently have is life insurance. Living outside of the US we have found that if we need to visit a doctor or hospital it is very inexpensive. It will not break us in the case of an emergency. This is an area that the US fails in. Health insurance in the US – are you really insuring your health? No. If you want to insure your health, eat right, exercise, and get rid of the stuff in your life that causes you stress. Go to doctors that promote your health – chiropractors, homeopaths, and acupuncturists. We don’t take any medications, either prescription or over-the-counter. We know of many natural remedies that take the place of these, usually food. If you think we’re crazy for not having health insurance, read about another family that doesn’t have or want health insurance. Simple & nice home We love having a comfortable home, not fancy or big. We live simple and just need a small, clean home with cozy places to sit and play. A beautiful view A beautiful view is inspirational and calming to us. Nature is so splendid and wonderful, we want to enjoy it as much as possible. We travel, but we also spend a lot of time at home and want to be surrounded by beauty. Our Computers Computers are a necessity for us. They are our connection to the world, our work and our communication devices. Good Cookware We travel with 3 chefs knives and 1 good cooking pan to every country we plan on cooking in. Even though the pan is heavy, I’m always grateful that I bring this along. Having good quality tools that we use everyday is essential for our comfort. Fresh fruits and vegetables Sometimes it costs more, but it is worth it to buy organic and local produce. In the long run, after you cut out the processed foods, it will cost less. Framed Photos We carry around 6 framed photos that we put around our house to make it feel like our home. This little bit does so much in creating a personal space and warm inviting feel to a home. If we were constantly traveling or backpacking, we would not take these, but since we stay put for 6 months or longer at a time, it’s worth it. Clothes Of course we have clothes, but we tend to wear the same 5 or 6 outfits all the time. We probably can decrease our wardrobes, since the rest of our clothes just take up closet space. We don’t really spoil ourselves with material things anymore. What we save on not buying things, we spend on experiences and lifestyle. We take a monthly mini-vacation that allows us to see more of the country we are living in, have new and interesting experiences and give us a break from our amazing, but everyday life. We get massages every 2 weeks. Which costs a lot less where we live than in the US. When our interest is peaked, we explore it, such as K’s upcoming Scuba certification or my Yoga certification. We hire a housekeeper. We have a housekeeper come in and thoroughly clean the entire house and cook for us once per week. It is inexpensive where we are currently living and it is a big chore that we don’t have to worry about. Family on Bikes : Living with less: What can you ditch?